Stolen items in your inventory will be marked with a red hand. As long as this tag is present, the item is considered stolen. Any stolen items in your possession will be confiscated and retained by the guards if you are arrested. Furthermore, most merchants will not buy stolen items and the items will not appear in the list of goods that can be sold. Only merchants whose responsibility is less than 30 will buy your stolen stock, specifically; Thieves Guild fences (only stolen items sold to fences count towards the Independent Thievery quest), one of the Dark Brotherhood Murderers (after completing the Dark Brotherhood questline), Manheim Maulhand at the Inn of Ill Omen, and Raven Biter at The Choosy Beggar in Bliss. Merchants added by the Thieves Den download also have low enough responsibility to purchase stolen items. To serve your sentence, sleep in a cell bed. You'll awaken when your time has been served. For each day you serve in jail, one of the following skills will be decreased, up to a maximum of ten skill decreases: Armorer, Athletics, Blade, Block, Blunt, Hand to Hand, Heavy Armor, Alchemy, Alteration (listed in order of decreasing likelihood). The selected skill will be lowered by one point, unless there is only 1 point in that skill. As in Cyrodiil, committing a crime in the Shivering Isles that is witnessed will result in a bounty being placed on your head. This bounty is tracked separately from bounties acquired in Cyrodiil. Golden Saints and Dark Seducers will attempt to arrest you. If you escape the arrest and later return with a low bounty, talking to a guard will result in another arrest attempt, but otherwise they will not approach you. But if your bounty exceeds 1000 gold, any guard who sees you will immediately attempt an arrest. 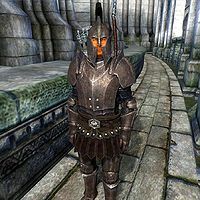 Unlike the guards in Cyrodiil, it is not possible to persuade the guards in the Shivering Isles to overlook your crimes, though they will be less brusque if you have a high disposition with them. As you climb the ranks of the Court of Madness, they will become more courteous to you, and the options you receive during an arrest will change. "What luck! You're trespassing! I'm a guard! And I LOVE my job!" "Trespassing in the Imperial Palace is punishable by death." (Restricted areas of the Imperial Palace)"
"It's the Gray Fox! You're under arrest!" "You should have paid the fine!" "Hmm. Body's still warm. Looks like there's a killer about." "Stay where you are, thief!" "I saw that, criminal scum!" "Drop it, you sticky-palmed little worm!" 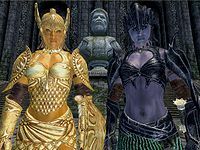 After becoming the Duke/Duchess of Mania or Dementia the guards in the Shivering Isles will treat you more courteously. After mantling Sheogorath, Prince of Madness, the guards of the Shivering Isles will treat you with reverence. They will, however, still confront you after committing a crime. The conjurer from the Spell Tomes official download. This page was last modified on 1 February 2019, at 20:17.